The fresh tomatoes are cooking without adding any salt. A true organic tomatoes with an emphasis on purity and quality, each variety is made with 100% organic ingredients and contains no sugar, no concentrate and no dried herbs. 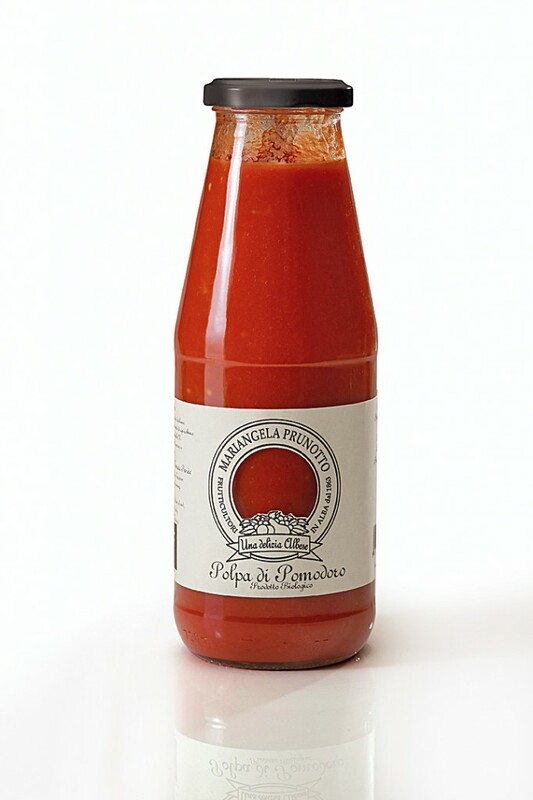 These incredible organic sauces have an unsurpassed quality full of fresh, vibrant flavors. The way of transforming is very simple and fast and will permit you to taste the really best Italian Tomatoes crop at the really right moment. The taste is better than the fresh! … and you will have the opportunity to try them hors season. The sause is ready to be use only adding on your cooked pasta Italian extra virgin olive oil. It is a really simple tomato and you can use as base to your receipt intstead of the fresh tomatoes. The tomato is botanically of the family of Solanacae, and is an annual plant. This fruits are normally red and they are at the base of a lot of dishes of the mediterranean cuisine. The red fruit is reach of the carotene lycopene, one of the most powerful natural antioxidants. The Tomatoes are originnaly from center/south America. Was knowm from the Atzechi with the name of xitomatl, the word tomatl indicated fruits similari. The tomato sauces begin an important in theys cuisine. In Europe the tomatoes arrived in the 1540 but the coltivation and diffusion will start on the second half of XVII century. After the 1600 in Italy was cultived in the South of Italy, arriving years later in the north.